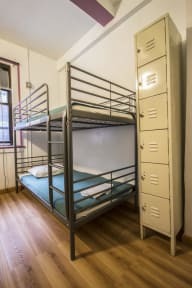 This hostel has been a great place for me, the staff is super friendly and allways 24/7 willing to help you out with anything you need (info on food/places to see/...) It's located right next to central park wich is great and if you want to go out, you have easy acces to subway downtown or wherever you wanna go. I'm convinced that this is the best place to go when you're looking at location and affordabillity. Special thanks to Alex and Mariane at the front desk! You guys are the best !! Okay for a cheap stay. But it was not the best experience. Didn't feel at ease in my room. Had to pay to store my suitcase there for a few hours. Glad I only stayed one night. 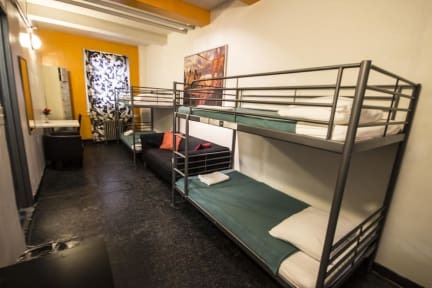 This facility was without doubt the worst hostel I ever stayed in. I am satisfied with security and location, but don't get me wrong: those are the bare minimum. What the hostel did not have: - cooking station or equipment - any equipment related to food whatsoever (including silverware, plates and cups) - a sufficient amount of outlets Also, there was not enough room to allow each person in the dorm to properly store their belongings. Most people in the room had stuff on their bed. Family room was great. Showers and toilets for women one floor down. Staff was friendly, but not helpful, we had to find out everything / facilities ourselves, not able to answer questions about activities, transport, ... Due to subway changes, it took us over 1 hour to get downtown - nobody informed us about weekend changes there. Hostel not very clean dark paint no wireless at the Room. One réceptionniste looks Like Asian not friendly Talking. The ôthers working at night-were ok Well situated near downtown. Kamerpas telkens de geblokkeerd waardoor ik de kamer niet binnen kwam. GEEN 24-hour reception & security. Vaak aan de balie gewacht totdat er iemand kwam. Na aantal keer op de balie-bel gedrukt te hebben kwam er niemand. Aantal x voor gesloten voordeur gestaan omdat mijn pasje het wéér niet deed. Klant van het hostel deed uiteindelijk open terwijl een Baliemedewerker aanwezig was. BETALEN voor luggage room bij uitchecken BELACHELIJK! GEEN activiteiten GEEN kamerventilatie, duister.